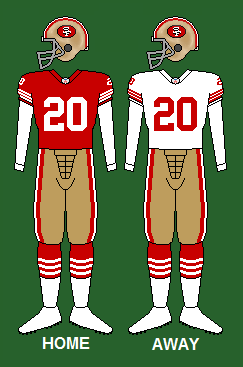 The San Francisco 49ers entered the 1990 season heavily favoured to win their third consecutive Super Bowl. The season was highlighted by their defeat of the New York Giants on Monday Night Football. Throughout the season, the 49ers and the Giants were the two best teams in the NFL. The 49ers would face off against the Giants in the NFC Championship Game. Between 1988 and 1990, the 49ers set a league record with 18 consecutive road victories. Jerry Rice had a career year by becoming the fourth receiver in the history of American football to have at least 100 receptions in one season. The 49ers won their fifth consecutive NFC West Division Title. Dating back to 1989, the 49ers completed a fifteen-game unbeaten streak in the regular season (5 victories in the last 5 games of 1989 and 10 victories in the first ten games of 1990). Following the 1990 season, the 49ers left team stalwarts Roger Craig and Ronnie Lott unprotected and let them go to the Los Angeles Raiders via Plan B free agency. The 49ers were the closest team in NFL history to "three peat" in the Super Bowl, losing in the final seconds on a field goal by the Giants in the NFC Championship Game. The season ended on quite a haunting note, because Roger Craig fumbled with only a few minutes left while the 49ers were driving to score the game clinching touchdown, the ball was recovered by the Giants Lawrence Taylor and they began driving to kick the game winning field goal, they ended up winning 15-13. The words of Pat Summerall "There will be no three peat!" haunt 49ers fans to this day. October 14, 1990 – Joe Montana set a 49ers record by throwing for 476 yards in one game and throwing six touchdown passes. October 14, 1990 – Jerry Rice set a 49ers record with 5 touchdown receptions and 30 points in one game. November 4, 1990 – In a game versus the Green Bay Packers, Joe Montana threw for 411 yards and 3 touchdown passes. December 3, 1990 – The 10–1 49ers played the 10–1 New York Giants on Monday Night Football. It was the second highest rated Monday Night game ever at the time. The game had a 42% share and a 26.9 rating. December 9, 1990 – The 49ers beat the Cincinnati Bengals in overtime. Mike Cofer kicked a 23-yard field goal to give the 49ers a 20–17 victory. Just like the regular season game between the two teams won by the 49ers 7–3 the championship game was mostly a defensive battle. San Francisco running back Roger Craig's fumble with 2:36 left in the game led to Giants kicker Matt Bahr's 42-yard game-winning field goal as time ran out. Bahr was New York's only scorer, as he made 5 out of 6 field goals. Despite not scoring a TD in eight quarters against the 49ers, the Giants moved on to the Super Bowl with their victory. ↑ "1990 NFL Pro Bowlers". Pro-Football-Reference.com. ↑ "1990 NFL All-Pros". Pro-Football-Reference.com.